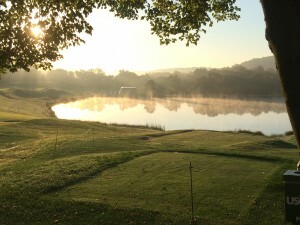 Fog rises over a pond at Stonewall Golf Links, site of the 2016 U.S. Mid-Amateur Championship. This week marks the end of this column’s eighteenth year. Like those before it, 2016 was a busy and eventful twelve months for golf in the Cape Region. January—Classic match play maxims and situations are observed during the U.S. Senior Amateur at Hidden Creek Golf Club, in Egg Harbor Township, NJ. Rookery South’s assistant golf pro Chris Osberg is the subject of a Cape Region Pro-File. Pete Oakley reports in on his recent tournament success in Florida at the PGA Quarter-Century Championship. A new USGA rule prohibiting posting of scores while playing solo brings Greta Garbo to mind. February—The PGA Merchandise Show is a major of its own, and the 2016 edition had enough material for several columns. I learn how the new Cleveland golf wedge analyzer works. A newly revamped Ben Hogan Golf Company highlights its new line of hybrid clubs and irons. Poptical sunglasses wrap the face like many sports lenses, but fold small. Jamie Palokas, golf superintendent at Baywood Greens, outlines the club’s wintertime restoration and improvement projects. March—The PGA Show provides a good opportunity to compare new cotton fabric designs with technical fabrics. The Cape Henlopen High School golf team gathers for the 2016 season. The New Balance store on Route 1 carries a new line of golf shoes. An interview with Ping’s VP for engineering produces a Spock-like reaction. Attitude counts, as shown in a story from the 2015 U.S. Senior Amateur. April—Cape’s golf team wins its first two matches of the year, but loses to traditional rival Caesar Rodney. Bob Curry of Rehoboth Beach CC celebrates two aces in two days. The young Viking squad loses to Delmar, Dover, and Indian River, with their inexperience showing, but picks up two wins against Sussex Central and Smyrna. The annual Golf Writers tournament plays Mid-Pines, Pine Needles, and Southern Pines. The University of Delaware’s women’s golf team qualifies for the NCAA Regionals for the first time, but fails to advance to the Nationals. May—The Vikings conquer the Delmarva Christian golf team, as well as Seaford, Lake Forest, and Woodbridge (by forfeit). A Texas journalist writes a fine biography of Harvey Penick of Little Red Book fame. Cape loses its last match of the year to Polytech, finishing 8-8 and out of the team competition in the state championship. Matt Zehner and Jack Ashby represent the Vikings in the state’s individual category. June—Anna Nordqvist gives an amiable interview in the lead-up to her eventual successful defense of her 2015 victory in the ShopRite LPGA Classic, near Atlantic City, NJ. Stevie Scales makes a hole in one during the Ladies Scramble at The Rookery. I enjoy watching The Golf Channel’s Karen Stupples play in the pro-am and competition at this year’s ShopRite tournament. Jack Ashby is among the recipients of a college scholarship from the DSGA. Sarah Koon of Lewes also wins a stipend from the Stephen R. Lett Scholarship Fund. July—Mark Haschemeyer, superintendent at Kings Creek, shows off the beneficial effects of his tree removal program. Steve Farrell, the new head golf pro at the just-opened Plantation Lakes course in Millsboro, gives a guided tour. I test several golf apparel products in high heat and humidity. A young Symetra Tour golfer plays through the pain of a stress fracture in her left arm. Local clubs are busy with their tournament schedules. August—Several Cape Region golfers compete at this year’s Delaware Open. I provide tips on how to enjoy watching a practice round at the PGA Championship at Baltusrol. The successful return of golf to the Olympics has some folks thinking of adding to the competitive formats. The PGA Junior League has a fine season at Cape Region golf clubs. September—The Patriot Golf Day fundraiser continues at Cape Region golf clubs. I begin a series of columns about the 2016 U.S. Women’s Amateur, held at Rolling Green Golf Club in Springfield, PA. Local club champions are crowned in several events. Famed sports psychologist Bob Rotella gives a familiar-sounding and well-received speech at Heritage Shores. October—The U.S. Women’s Amateur concludes with an amazing final round. I test a new Carnoustie cotton golf shirt in fall weather. The UD Lady Blue Hens take second place in their fourth annual Fall Invitational at Rehoboth Beach CC. November—Heritage Shores GC’s assistant pro Zac Oakley wins a Philadelphia PGA Section tournament. Rules issues pop up in the medal rounds of this year’s U.S. Mid-Amateur. A new Rehoboth golf simulator company offers time slots for Cape Region golfers hoping to keep their game in shape. December—Kindness and karma make an appearance at The Rookery’s practice range. There are always several items to avoid giving golfers for Christmas, but the stuff that should be given is available at Cape Region clubs and golf stores. Tom Carroll makes a hole in one. Rehoboth junior golfer Sawyer Brockstedt plays very well at the Doral-Publix Junior Golf Classic in Miami, FL.